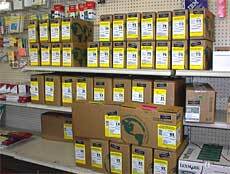 [OCT. 30, 2001] An office supply store that allows you to buy in bulk, stores excess products for you and delivers as you need them? That store is Glenn Brunk Stationers of Springfield, and it is coming to Lincoln. Company president Edward D. Stanfield says, "The customer drives the bus." One example of what he means is free delivery of even a single item and placement of products wherever the customer wants, even if that means each box of paper goes to a different room. Other services include installation of office furnishings, 24-hour-a-day ordering from the Internet site and service by sales representatives. Stanfield said he hopes to open a Lincoln store by the first of the year. His son Ed Stanfield Jr. has begun looking at Lincoln locations. The senior Stanfield said he is seeking a downtown site: "We are more of a traditional company, and I want to be in a traditional location." He said Lincoln struck him as a "small but independent town" with much good-sized business for its size. The first step, taken in July, was to join the Lincoln/Logan County Chamber of Commerce and to contact Mark Smith, director of economic development. Since then Glenn Brunk sales representatives have secured a number of accounts in Lincoln. Stanfield expects to hire one to three employees here, beginning with someone to operate the store. "In Lincoln I envision more products and more depth" in the retail store than in Springfield, he said. At first deliveries will be made from Springfield, and bulky products bought by Lincoln customers may have to be stored in the Springfield warehouse. Eventually Stanfield hopes for on-site storage and a driver based in Lincoln. "The intent is to be a local company in Lincoln," he said. Glenn Brunk Stationers’ motto is "Providing the best customer service for 42 years." One aspect of this is knowing products and their relative differences. For example, Stanfield asked, why sell three different staplers? "Each has a particular niche," he said, and Glenn Brunk salespeople have to be able to explain what they are. "We’re not the grocery store," he explained. "We survive because of service." Stanfield, who worked as an adult rehabilitation counselor for 10 years, is proud of being the only retail agent in Springfield for replacement toner cartridges remanufactured by United Cerebral Palsy. Both disabled and non-disabled people participate in rebuilding the cartridges, which are fully guaranteed; the cartridge will be replaced or money refunded if it fails while it still contains toner. Stanfield said there is a huge difference between remanufactured cartridges and older ones that were refilled and then leaked or did not work. United Cerebral Palsy has a cartridge analyzer that tells what components need to be replaced. The rebuilt cartridge is then reanalyzed to make sure it passes before it is boxed. Stanfield said the analyzer can even predict future failure so a component can be replaced before it fails. "There is no down side to it," he said. Prices are one-half to one-third off retail; the cartridge is "as good as or better than" new; and proceeds go to programs for disabled children and adults. The Glenn Brunk store at 2222 S. Sixth St. in Springfield is surprisingly small for a company that sells office furniture as well as supplies. Stanfield said he furnishes individual offices or whole buildings but "most of the work is done in our customer’s office" using catalogs and computer modeling. Furniture brands offered include HON, Creative, Indiana Desk, National (a division of Kimball Industries), LUI and DMI. Some ready-to-assemble furniture from Bush, O’Sullivan and Sauder is available, but Glenn Brunk delivers it assembled. The business also offers repaired scratch-and-dent office furniture. Stanfield buys it from wholesalers sight unseen, refurbishes it and sells it at 40 percent of the retail price. Just now, he said, he is long on lateral files. The business was founded in 1955 by Glenn and Mary Brunk. Mr. Brunk was a former combat medic who landed at Omaha Beach on D-Day. The Brunks began business from their garage, offered only one product — billing machine ribbons — and installed them free. Stanfield said the installation was a major factor because the ribbons went "deep in the bowels of the monster machines." The business moved first to Fifth Street and then to its current location on Sixth Street, next door to Gallagher’s steakhouse. After Glenn died in 1972, Mary Brunk ran the business. 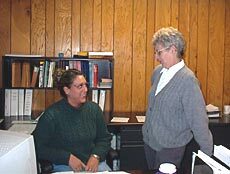 In 1988 she hired Malinda Stanfield as bookkeeper, then office manager, and in 1997 the Stanfields bought the business with the provision that the name not change. 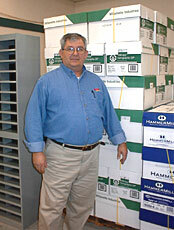 Ed Stanfield, who had managed copier dealerships, made the shift from the hardware to the supplies that go in it. He said it has been "an absolute howl ever since." All three Stanfield sons work in the business. Ed Jr. is a sales representative, Joe is a delivery driver, and Bill, a Champaign resident, works on his day off. Glenn Brunk Stationers also employs two other sales representatives, another driver and a bookkeeper. Ed Stanfield Sr. is president, and Malinda Stanfield is secretary-treasurer. The company stocks a larger variety of paper rolls for such machines as cash registers and credit card machines than anyone else in Springfield, Ed Stanfield said. As with other bulky products, Glenn Brunk will store excess rolls for the customer. Each customer has a separate skid in the warehouse, and employees can easily see when one is running low. Among products in the warehouse are Willamette Industries boxes made in Lincoln and Sphinx paper for a business that requires paper made in a union mill. The company sells in quantities ranging from individual envelopes and notepads to reams and skids of paper. Orders are placed twice daily, delivered at 2 a.m., opened and repackaged for customers, with drivers on the road by 9 a.m. Stanfield said he envisions a similar procedure for the Lincoln store. [OCT. 2, 2001] Lincoln’s annual Christmas parade will be in downtown Lincoln on Thursday, Nov. 29, at 7 p.m. "May Your Days Be Merry and Bright" is the theme for this year’s parade, co-sponsored by the Lincoln/Logan County Chamber of Commerce and the city of Lincoln. The chamber is accepting entries from businesses, industry, governmental agencies, schools, civic and not-for-profit groups, and religious, youth and charitable organizations. There is no charge to enter, and cash prizes will be awarded. The evening parade features marching bands, lighted floats and vehicles, and military marching units. Groups are encouraged to use motorized vehicles in an attempt to reduce the number of walking entries. "We’re also looking for a business or a group to sponsor the Santa Claus float," says chamber director Bobbi Abbott. "The parade’s final entry is the Santa float, and it needs to be impressive!" Interested participants may call the chamber of commerce at 735-2385 or e-mail chamber@lincolnillinois.com for an entry form or further information. [OCT. 29, 2001] The Lincoln branch of A.G. Edwards & Sons will host a seminar entitled "Tax Reform and Your Investment Strategies" seminar on Wednesday, Nov. 7, at 7 p.m. and on Saturday, Nov. 10, at 10 a.m. The program will be at Heartland Community College, 620 Broadway St. in Lincoln. Financial consultant Tom Kissel will speak on the new tax measures and how they affect individual investors. His discussion will address changes in the tax code pertaining to income taxes, education savings, retirement savings, and gift and estate taxes. The seminar is free for anyone to attend; however, seating is limited. For more information on the seminar or to make reservations, please contact Brittney Van Fossan, financial associate, at A.G. Edwards. The phone number is 732-3877, or call toll free (800) 596-0014.